Contrary to its name, the Arctic raspberry is not as much of an arctic plant as its name suggests. Also refered to as Arctic bramble, Arctic Plumboy, or Nagoonberry, this perennial plant is in the Rose Family (Rosaceae) and it is rhizomatous. 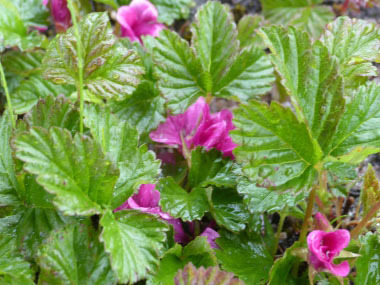 Rubus arcticus is native to the Arctic, subarctic, and alpine regions. It is a commonly foraged berry in Scandanavia and in Estonia, is considered the most profitable berry in Estonia. 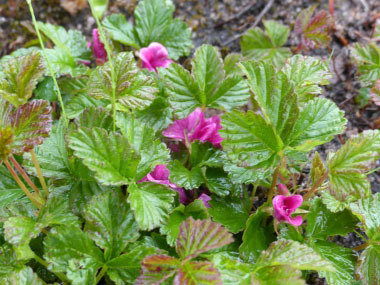 Arctic raspberries often forms stands (mats) consisting of a single plant. Distinguishing Features: In late spring these pink (or lavender to purple) flowers appear and by mid-summer they become sweet, red raspberries. Depending on growing conditions, the berries may be a brownish purplish red. They are aromatic, and form a sweet aggregate of drupes. The fruits are smaller than a regular raspberry. In autumn, the green foliage changes to a colourful crimson and burgundy. 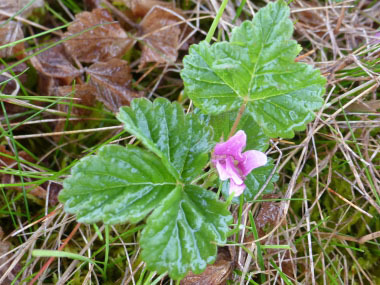 Flowers: Arctic raspberry flowers are pink–lavender-purple (occasionally white), and they measure 15 to 25 mm (0.6–1”) broad. There are usually six to nine flower petals. There are numerous stamens and pistils. Flowers usually occur solitary and appear at the tip of a long slender stalk. 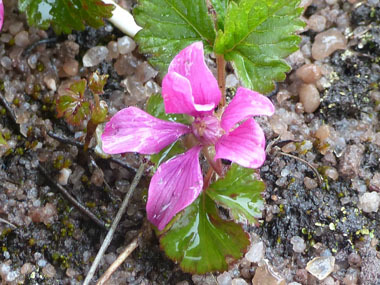 Flowering time is anywhere from May to July depending on location. Fields of Nutrition has medicinal benefits and vitamin/mineral content of Arctic Raspberry. Leaves: The leaves occur alternate, stalked, and stipulate. They are typically about 5 cm (2”) long. The leaf blades are palmate, with three leaflets. The terminal leaflet is diamond-shaped with lateral leaflets being round-edged and unsymmetrical. All leaves have toothed margins, sparsely hairy, and sometimes reddish. 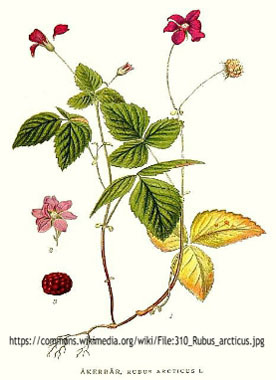 Height: The Arctic raspberry plant tends to grow anywhere from 10 to 25 cm (4 to 10”) tall. The stem is glossy and spineless. Habitat: These plants can be found in damp meadows, along shorelines, river banks and in some sphagnum swamps. 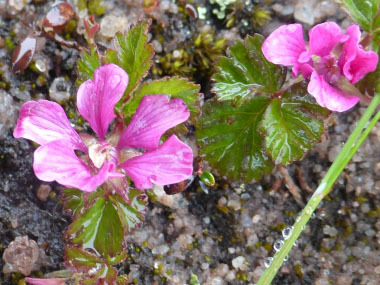 This plant is found throughout Canada, the northern U.S. (and along the northern west and east U.S. Coasts). It also grows throughout the more northern regions of Europe, Asia, and the UK. It does not like shaded areas. 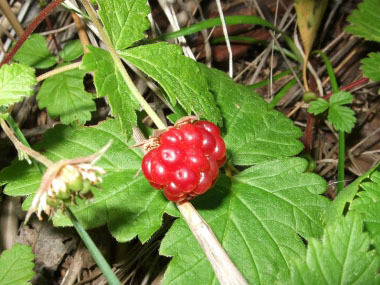 Edible parts: Arctic raspberries do not store well fresh because the stalk doesn’t separate from the berry in such a way that it could be stored intact. Traditionally these berries are made into jam, juice and nectar. They can also be used as a base for wines or liqueurs. Berries can be eaten fresh or baked. Fresh or dried leaves and flowers can be used as a tea or tossed into a salad. Similar plants: Rubus pubescens (Dwarf Raspberry).